Now that 3D printers are cheaper to produce, experts predict it won't be long before they are common in our homes. Even today, more companies realise the potential for 3D-printed applications in their own businesses. 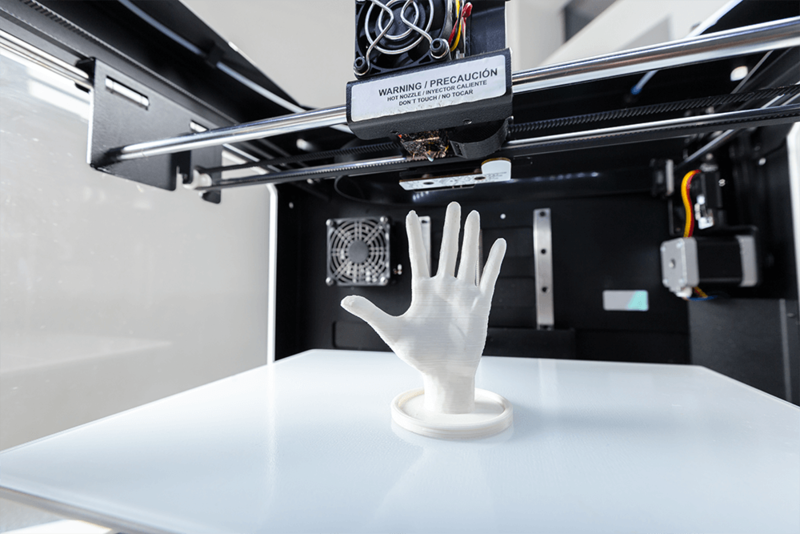 Since the technology moved from the theoretical to the real, people are expanding the boundaries of what's possible to print from very practical applications for manufacturing and medical devices to those just for fun. Here are just a few of the amazing real-world examples of 3D printing in 2018. 3D printing had its start in the 1980s when Chuck Hull designed and printed a small cup. Also known as additive manufacturing, 3D-printed objects are created from a digital file and a printer that lays down successive layers of material until the object is complete. Each layer is a thinly sliced cross-section of the actual object. It uses less material than traditional manufacturing. Most materials used in 3D printing are thermoplastics—a type of plastic that becomes liquid when heated but will solidify when cool and not be weakened. However, as the technology matures, researchers are finding new materials—even edible—that can be 3D printed. From vets who have made a 3D-printed mask to help a dog recover from severe facial injuries to surgical guides, prosthetic limbs and models of body parts, the applications for 3D printing to impact medical strategies is vast. In an experiment conducted by Northwestern University Feinberg School of Medicine in Chicago, a mouse with 3D-printed ovaries gave birth to healthy pups which could bode well for human interventions after more research is done. In less than 24 hours, a 400-square-foot house was constructed in a suburb of Moscow with 3D printing technology. The possibilities for quickly erecting houses and other structures with 3D printing are intriguing when time is critical such as to create emergency shelters for areas after a natural disaster. Additionally, the potential for new architectural visions to be realised, that weren't previously possible with current manufacturing methods will lead to design innovations. An entire two-storey house was 3D printed from concrete in Beijing in just 45 days from start to finish. Researchers from Germany even 3D-printed a house of glass—currently only available in miniature size—but they were the first to figure out how to 3D print with glass. When you think about traditional cake decorating techniques—pushing frosting through a tip to create designs—it’s very similar to the 3D printing application process where material is pushed through a needle and formed one layer at a time. Just as it’s done with 3D plastic printing, a chocolate 3D printer starts with a digital design that is sliced by a computer programme to create layers; then the object will be created layer by layer. Since chocolate hardens quickly at room temperature, it’s an ideal edible material for 3D printing, but companies have printed other edible creations from ice cream, cookie dough, marzipan and even hamburger patties. Defence Distributed was the first to create a 3D-printed firearm in 2013 called the Liberator. While there are 3D printers that can use metal, they are very expensive, so the Liberator was printed using plastic. The advances of 3D technology and the ability to print your own firearm from home has raised questions about how to address the technology in gun control regulations. There are many applications across several industries including automotive, aerospace and more for 3D printing in manufacturing from printing replacement parts of machinery and prototyping new products (with the added benefit of recycling the models after you’re done) to creating moulds and jigs to improve the efficiency of the production process. The bodies of electric vehicles and other cars have been 3D printed. Manufacturers can use 3D printing to lower costs and produce products quicker. From an incredible 3Dvarius, inspired by a Stradivarius violin, to flutes and banjos, several musical instruments and parts of instruments such as mouthpieces have been created using a 3D printer. In fact, the world’s first live concert with a 3D-printed band (drum, keyboard, and two guitars) took place at Lund University in Sweden. The extraordinary thing about 3D printing is that it can be used to create just about anything your mind can conjure up. It just requires the digital file and the right material. While experts are still troubleshooting how to incorporate 3D printing processes into all areas, weekend warriors are finding all kinds of clever hacks to create with their 3D printers including trash cans, cup holders, electric outlet plates and more.